memories of when I left the UMC ministry in 1995. My conference was leveraged by the liberal elements. They had a lion’s share of the Board of Ordained Ministry, about 1/2 of the cabinet, over 1/4 of the clergy with many new arrivals freshly graduated from seminary. The homosexual issue was on the burner when a woman FC Elder was caught doing weddings for the gay community. A slap on the hand and everything was forgotten. Do some of you remember the debate of Sophia worship? Another problem that was allowed to fester among the UMC clergy without much ecclesiastical involvement. Those participating in such events were usually seen as avant garde theologians. So here you are in 2019. The progressives hold a lot of cards. I would like to see clergy finally rally for their convictions. How much do you love you church? Not the building but the Body of Christ. You know they want you to just walk away so they get to keep all the material wealth. I have a better idea. How about these liberal members walk away? Bet they stick around and move into even more leadership positions. This is a state of emergency for United Methodism. Our most illustrious orthodox Wesleyan scholars and prominente must insist on being heard. Our episcopal leaders have acted foolishly. But the church need not march with them into the abyss. We should not follow them there. 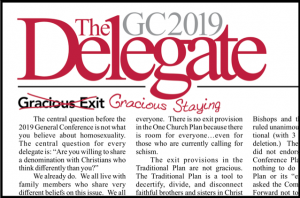 Reading that “Delegate” newsletter is probably one the most disturbing statements that I have ever seen coming from people claiming to be Methodists. Unbelievable. No, I could NEVER be a member of any kind of Christian church that these people envision. And, as Gary Bebop stated, “this is a state of emergency for United Methodism”, INDEED! And yet, is it not the function of the General Conference to ammend and adapt our current doctrine? Or are we doomed to stagnate and become a “dead sect” just because our denomination includes people who harbor a spectrum of theological views? This “spectrum of theological views” has reached schism. We are “stagnate” in North America and Europe because of this. A “dead sect”? 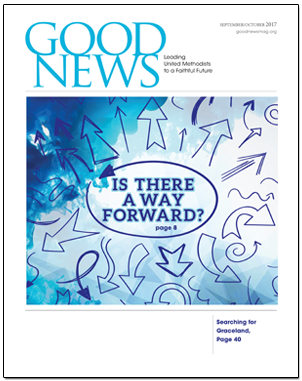 Actually, the church is growing where adherence to Scriptural authority is practiced and the Good News Gospel of Jesus Christ is being enthusiastically preached —- where these “spectrum of theological views” are not being advocated. And, this ‘one’ church plan is an attempt to radicalize this “spectrum of theological views” by officially establishing two diametrically opposite Biblical positions while attempting to sell it as one unified church! This is no path to unity, is not a sustainable way forward — unless this plan is just step one of forcefully liberalizing the entire denomination, forcefully forging unity. This plan is the greatest deception ever attempted in Methodism. And all this distortion, name calling, and false descriptions of the traditionalists and their plans is egregiously reprehensible. Yes the spectrum of heterodox theological views is sickening and to be expected from the far left in our denomination. It is time to either enforce the BOD while maintaining Scriptural authority or it is time to separate and go our separate ways. Ichabod the glory has long ago departed from The UMC. How said it is…. A sorrowful litany until I got to William’s “Actually, the church is growing where adherence to Scriptural authority is practiced and the Good News Gospel of Jesus Christ is being enthusiastically preached…” A singular, shining truth, worthy of the bluntness of Paul. Want to follow Christ? Follow Him. Want to avoid scriptural authority, then call yourself something else and start your own religion. Simple as that. A view from the pew: My answer to your absolutely right question is a resounding NO! However, when it comes to the traditionalist plan that allows progressive thinking as long as they are willing to live within the confines of the Discipline, I am not convinced….